Last week on Thursday, NASA released a new view of our home planet created entirely from the selfies shared by people all over the world. 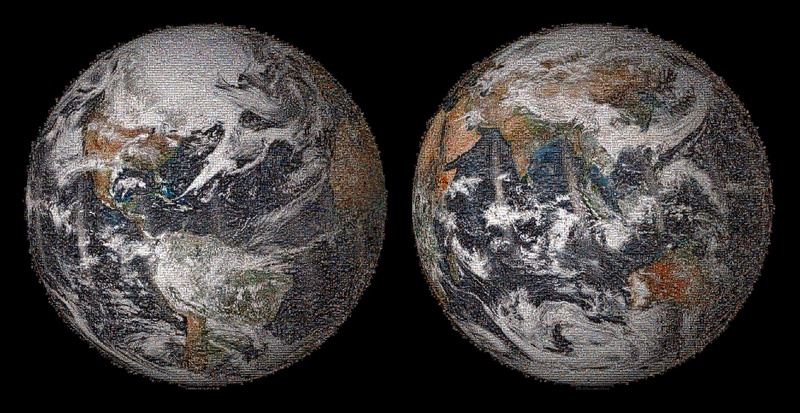 The “Global Selfie” mosaic, showcased above, was built using more than 36,000 individual photographs. These pictures were drawn from more than 50,000 images tagged #GlobalSelfie and posted on or around Earth Day, April 22, on Twitter, Instagram, Facebook, Google+ and Flickr. The project was designed to encourage environmental awareness and recognize the agency’s ongoing work to protect our home planet. Selfies were posted by people on every continent and 113 countries and regions, from Antarctica to Yemen, Greenland to Guatemala, and Pakistan to Peru. “With the Global Selfie, NASA used crowd-sourced digital imagery to illustrate a different aspect of Earth than has been measured from satellites for decades: a mosaic of faces from around the globe,” said Peg Luce, deputy director of the Earth Science Division in the Science Mission Directorate at NASA Headquarters, Washington. The GigaPan image of Earth is based on views of each hemisphere captured on Earth Day 2014 by the Visible Infrared Imaging Radiometer Suite instrument on the Suomi National Polar-orbiting Partnership (NPP) satellite. Suomi NPP, a joint mission between NASA and the National Oceanic and Atmospheric Administration, collects data on both long-term climate change and short-term weather conditions. With 17 Earth-observing satellites in orbit and ambitious airborne and ground-based observation campaigns, NASA produces data that help scientists get a clearer picture of Earth’s interconnected natural systems. The agency shares this unique knowledge with the global community and works with institutions in the United States and around the world that contribute to understanding and protecting our home planet.